This page shows how to build a free standing carport and also outlines how metal carports are constructed from the beginning step, with images included. 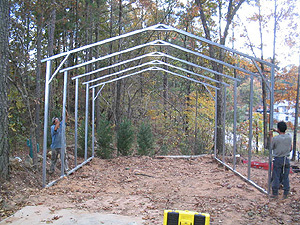 Notice the images showing how to build a carport shown here. Step One: The first step is to layout the base rails as illustrated in the photo to the left. Then the base rails are positioned the proper distance from each other and anchored to the ground where base rails are parallel and square to each other. 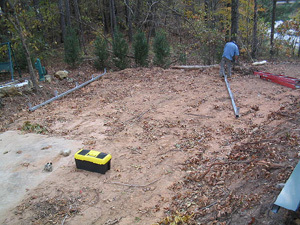 This will provide a solid base for the other parts that make up your carport. 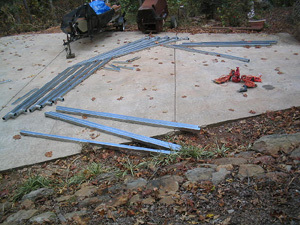 Step Two: The bows or trusses and legs of the carport are laid out on the ground. The legs of the carport are slid into the sleeves on the trusses and securely fastened together. 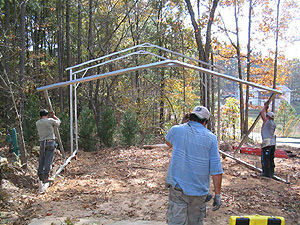 Step Three: The installation team then lifts up the bows or trusses with the legs attached and slips the legs over the raised metal sleeves on the base rails as illustrated in the photo to the left. If you look closely you can see the metal sleeves sticking up approximately 6” on the base rails. Step Four: The framing is then leveled and legs are plumbed. The frame is now square, plumb, level and ready for attaching the sheet metal. 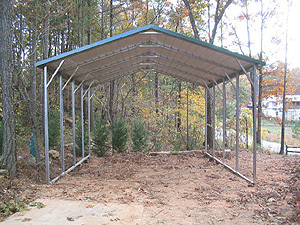 The proper setting of the frame is the key to a great looking carport. 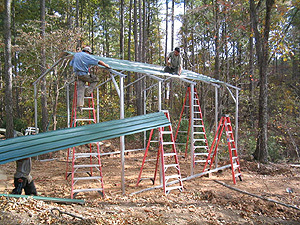 Step Five: Metal panels available in many different colors are positioned on the roof. Make sure you have the same amount of overhang on each end prior to fastening to the rafters with self-tapping screws. The screws have neoprene washers to prevent water intrusion. The final step is the installation of the trim. For a regular style carport, the trim is a fascia type applied to the ends only. For a box eve style, there is boxed eve trim for the entire perimeter of the roof. Step Six: You see the fruitage of hard work – a finished carport! Front view illustrated in photo here. Note: These instructions above are shown to illustrate the basic steps followed by our skilled installation teams, and the materials used to build a carport. This page is not designed to be an instruction manual.